Is your computer or laptop not working properly, or won't start? No worries, the Prototech repair experts will diagnose what's wrong and make all necessary repairs. How your repair process works. First, back up your data, then bring your device instore to Prototech. We can also back up your data in store as an additional service. 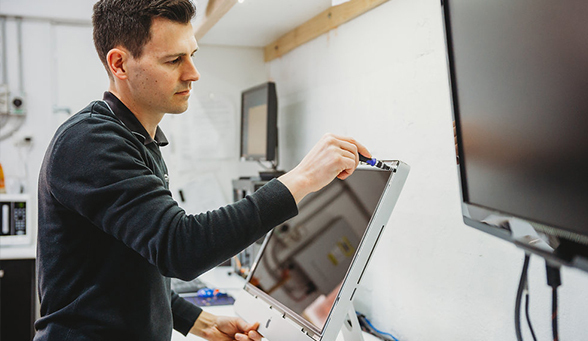 If you need a hardware repair, we'll give you an initial estimate of costs, but there may be other issues we can't see until we investigate your device further. To investigate your device, we'll collect a flat-rate labour fee of $80 in store or $110 in home/ on site for the first hour. Additional onsite hours are charged at $85 per hour at 15-minute intervals. We will then investigate your device and diagnose your issue. We will contact you for approval if the repair costs will be higher than your initial estimate.